The AggreScalp screen ... cost-effective and durable. 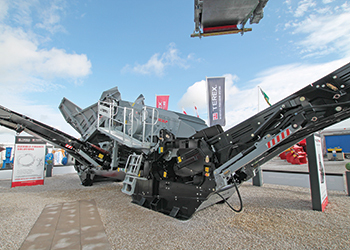 The AggreScalp screen and the FM UltraFines for recovery of fines were launched at one of the world’s largest working quarry shows, Hillhead, held in June in the UK, and proved a major hit with existing and potential new customers. The new products will serve an increasingly diverse range of materials handling sectors. The AggreScalp unit brings operators a well-proven, cost-effective and durable machine in a modular all-electric format. This is ideal for C&D recycling applications as well as quarry and mine overburdens and integrates seamlessly with other key TWS systems including AggreSand and AggreScrub. The UltraFines will tackle the increasing demand for fines recovery within numerous facets of the washing industry. The Terex FM UltraFines ... can recover material as low as 40 micron. The Terex AggreScalp is a versatile, high-performance heavy-duty electric screening machine that has the flexibility to operate as a two-way or three-way split screener. The highly aggressive screen can accept media including bofor bars, finger screens, woven mesh and 3D punch plates, which allows it to be used across a wide variety of applications. With onboard hydraulic folding product conveyors, hydraulic screen angle adjustment and single lift set-up, it remains easy to transport and easy to set up. The AggreScalp can work in conjunction with the Terex AggreSand range by providing a consistent feed material even in difficult applications. Together they form an efficient, lower operating cost aggregate and recycling solution, says Donnelly. The Terex FM UltraFines is a crucial step in efficient management and recovery of ultrafine sand from waste water streams, produced from washing processes. This ultra-fines recovery unit can process up to 450 cu m per hour of slurry, recovering material as low as 40 micron, thus reducing the volume of solids reporting to storage ponds or water treatment plants. Bringing together a centrifugal pump, a cluster of four hydrocyclones and a high-frequency dewatering screen on one chassis, the FM UltraFines also boasts a uniquely designed conical tank and anti-turbulence system, which is essential in the process of ultra-fines recovery, he points out. 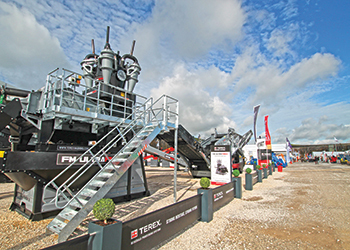 Terex Corporation is a global manufacturer of lifting and material processing products and services delivering lifecycle solutions that maximise customer return on investment.